For all Coffee Lovers: We offer fantastic coffe tours in various regions to get to know the roots of your favourite drink! Contact us for closer info about organic coffe plantation tours. Or follow this link to see the traditional Costa Rican Sock brewing method. Coffee is a shrub, from which trunk the main and the base branches grow. The latter ones are never cut, as they are unable to renew themselves. The foliage is persistent, the leaves of a deep and shiny green colour. The shrub blooms not until its fourth year. The delicate white flowers are composed of 5 to 6 petals and divided in groups of dozens on the secondary branches. Their strong scent recalls the smell of jasmine. The fruits (drupes in botany), also known as "cherries", are round, 1 to 2 cm in diameter, of light green when immature, and of a beautiful cherry-red at maturity. The fruits contain the precious double beans that appear in a colour ranging from light brown to green-blue before roasting. A coffee tree produces about 3 kilos of fruit per annum, which makes approximately 600 grams of beans. The tree can live up to 60 years and reaches the maximum of its production before the age of 30. Coffea Arabica from the Abyssinian plains (former name of Ethiopia). Coffea Canephora from the African tropical forests. Coffea Arabica is marketed under the name Arabica Coffee. Coffea Canephora under the name Robusta Coffee (in terms of taste its variety is far less interesting than Arabica). Many hybrids have been developed over the centuries. The reproduction of the plant is done either by cutting or by sowing seeds of the previous crop. This method does not, however, retain all the characteristics of the mother plant. In the wild state, the plant can reach 5 to 6 meters. For practical reasons cultivated plants are maintained at a height of 1 to 2 meters. Known and used only by a few insiders (doctors and botanists), coffee gradually spread throughout the East, particularly from Moka (port of Yemen). The Venetians then brought the precious beverage from Constantinople to Europe. In order to retain a monopoly on this flourishing trade, every grain of coffee was reheated before being sold, so that none can germinate. During the Renaissance, from the early seventeenth century, trade between East and West advanced but very few countries consumed this strangely coloured brew. A captain of the Dutch East India Company brought the first coffee seeds to Amsterdam. They were planted in a greenhouse of the famous Botanical Garden (Hortus Botanicus). The Dutch eventually began to cultivate coffee plants in India, Ceylon and Java. The success was such that Holland quickly became the world's leading power for coffee production. In 1720, the French Chevalier de Clieu introduced a coffee shrub to Martinique. The plant prospered and bore fruit, which were then planted on other islands, such as Guadeloupe and Santo Domingo. A century later coffee was grown in all Latin American countries. Since 1830 many coffee fincas were created, primarily in the Central Valley, where the climate is ideal from an altitude of 1200 m and at temperatures between 15-28 ° C. Coffee was transported to the port of Puntarenas in the famous ox-carts and became one of the first resources. The Coffee Barons (Cafetaleros), following the contemporary trend, began to build neoclassical buildings in San José, such as the National Theatre*. Today there are some 80’000 coffee producers and over 95 beneficios (processing facilities). The crop is among the world’s best. Despite the recent collapse of commodity prices, coffee is the fourth biggest segment of the national income (after tourism, banana and pineapple). *The neoclassical National Theatre (opened in October 1897) was built with tax money from coffee export. It features a magnificent allegory on coffee, which is also on the old ticket 5 Colon bill shown below. Find out how to brew coffee in a sock here. Grano de Oro is how the Costa Ricans named coffee beans. Indeed, these Golden Grains have made their wealth and thus secured development. Normally the “cherry” contains a double bean, but in Costa Rica – a "kingdom of nature” – the “cherry” sometimes produces a single seed, then called "caracoli." Some roasters collect them for a special clientele who appreciates coffee exclusively roasted from caracoli, which apparently have an unique aroma… Their scarcity leads to an according price, even if some fincas can produce up to 30% caracoli. The best altitude for coffee is between 1200 and 1800 m, and the shrub grows particularly well in volcanic soil. The plant likes heat but is sensitive to direct sunlight. Hence its successful proliferation in the Central Valley where the sun is rarely too hot due to significant cloud coverage. In the Central Valley, flowering begins 9 days after the first rains (March / April). The "cherries" mature between 8 and 10 months after flowering, depending on the altitude. Occasionally, and only in high altitude, the trees bloom 2 to 3 times a year. In Costa Rica the fruits (cherries or beans) are picked by hand. The country’s farming system is exceptional in Latin America: after an agrarian reform the natural wealth of coffee is exploited by 33’000 small farmers (and not by a small amount of big farms). The Finca Cristina around Paraiso is a good example. Minimum wages for agricultural workers were already introduced in 1935. Costa Rica is the world’s 10th largest exporter, with 150’000 tons per annum. In 2005, 300 million $ were earned with coffee, making it the 4th biggest source of income. In recent years, the production of organic coffee has increased heavily. Many of these coffee plantations are open to public on coffee tours. From November to March the manual harvest takes place in Costa Rica, which, unlike other countries produces only top quality coffee (the world's best). Only fully mature fruits are picked. Among other things, this method has the drawback of having to make several passes, as cherries from the same plant do not all mature at the same time. After the harvest, the seeds have to be separated from the pulp, which is done by using a rotating drum machine. The seeds are then fermented to remove the remaining slimy layer of mucilage. Once the grains are separated and washed they are dried, which can be done by sunlight in the open air, or by an industrial system, in large drums with warm air from timber-fuelled furnaces. The beans are then roasted, i.e. burned (the legend goes that the benefits of roasted coffee were discovered by chance, after a fire burning wild coffee in Africa…). The roasting process is fundamental for the quality of the drink. * This is why the major school holidays were set around this period so that children could participate in the harvest. The roots are being uprooted after 20 to 30 years to renew the plantation. The wood is in high demand from restaurants and it is also used to heat the plantation worker’s kitchen furnaces. After a composting process the pulp is used in the fields to improve the soil structure. In recent years, trials were under way to use the compressed flesh to fuel coffee drying furnaces. Coffee ground is also known to be a good fertilizer for roses. Coffee wood is also used to manufacture tourist souvenirs like fancy paper, jewellery, pens, etc. Coffee liquor and confectionery of all kinds (often in combination with chocolate) are further products deriving from coffee. Café rico para la salud! "Caffeine prevents colon cancer, diabetes and Parkinson's disease". A French researcher highlights the health benefits of coffee. Consuming coffee delays the onset of Parkinson's disease and reduces the risk of type 2 diabetes and colon cancer. The consumption of 3 to 4 cups per day decreases the likelihood of developing Parkinson's disease by 2 to 5 times. This conclusion applies to men, since the study was conducted on 8000 men for a period of 20 years. The protective molecule is caffeine. A study on postmenopausal women has shown that caffeine helps preventing Parkinson’s disease. But it has a negative impact on women undergoing hormonal treatment, increasing the risk for Parkinson’s disease. These analyses have also shown that moderate coffee consumption prevents type 2 diabetes and colon cancer. Here, the benefits are due to another molecule, polyphenol, which is an antioxidant. For example, coffee drinkers (with little or no sugar) can reduce the risk of type 2 diabetes by 15-60%. By consuming about 4 cups per day, the risk of colon cancer can be reduced by 24%. Caffeine is present in the coffee but also in tea and chocolate. The Costa Ricans consume an average of 4 kg of coffee a year. After the Finns (ca. 11.6 kg/person), Swedes have the world’s second highest coffee consumption (ca. 11 kg/person). Contrary to some preconceived notions, coffee does neither increase blood pressure nor cause heart disease or gastritis. On the contrary, coffee contains analgesic substances (i.e. against pain, including migraines). It can, however, cause sleeping problems and nervousness for some people, if over-consumed. Costa Rica is the 10th biggest exporter but it has the highest productiveness (900 kg/ha). The country exports 9/10 of its production. Alkaloids: Alkaloids are chemical compounds that are naturally produced by organisms (plants, bacteria, etc.). Morphine, quinine (a anti-malaria agent) and caffeine are all alkaloids. Coffee: (Caffè in Italian and qahwa in Arabic) is a seed (or bean) from the coffee tree, containing the alkaloid caffeine. It is roasted to develop its aroma and flavour. 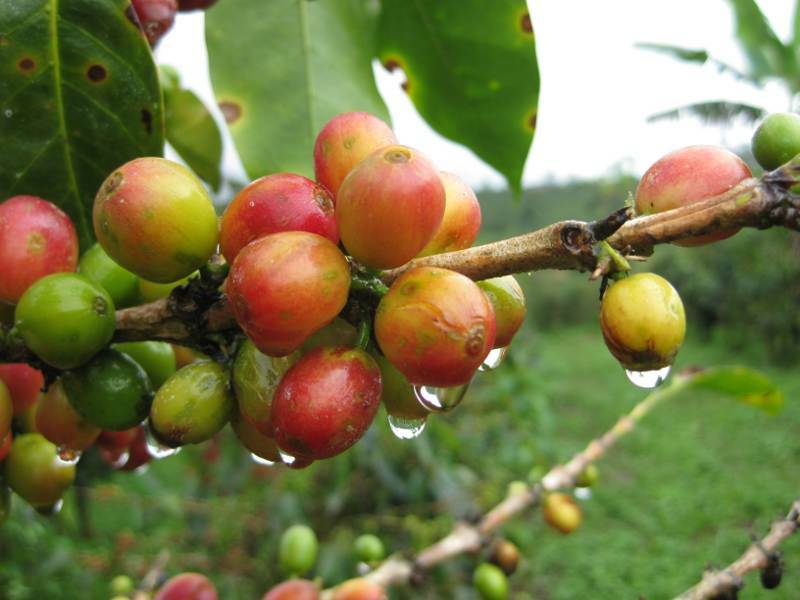 Coffee Tree: A tropical shrub, grown for its drupes, containing the famous coffee double bean. Drupe: (from Latin drupa: pulp). A stone fruit, such as cherries, apricots and coffee. Finca: "Farm" in Spanish. The place where coffee is grown. Gamopetalous: (from greek gamos: marriage). Is a term for flowers whose petals are connected; a corolla with fused petals. Persistant: In botany, this refers to the foliage of trees and shrubs. In the tropics many plants are evergreen and do not shed their leaves; coffee is among these. The opposite is “deciduous”. Rubiaceae: (from latin rubia: red) Belonging to the family of flowering plants. Tazita de café: A cup of coffee in Spanish. As many Central American, Costa Ricans have a tendency of using diminutives for many expressions.